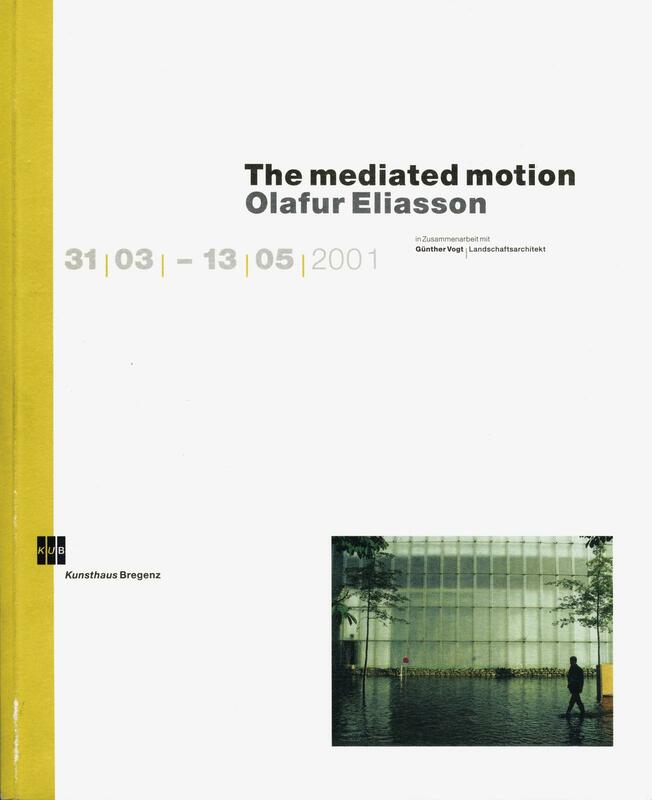 This catalogue was published to accompany The mediated motion, a large-scale installation spanning all four floors of Peter Zumthor’s Kunsthaus Bregenz in Austria, 2001, which was conceived in collaboration with the landscape architect Günther Vogt. Documenting the artwork in detail, the catalogue takes readers through its sequence of ‘interior landscapes’: on the ground floor was a collection of logs sprouting shiitake mushrooms (Lentinula edodes). Continuing to level one, visitors encountered a pond with duckweed (Lemna minor) floating on its surface, which they could cross via a series of pontoons. On level two, a floor of gently sloping compressed soil could be traversed, and on level three, a suspension bridge spanned a foggy room and terminated abruptly at a blank wall, forcing visitors to return along their original route. A staircase of roughly hewn wood was built on top of the existing concrete stairs, creating an unbroken transition from one landscape situation to the next. The bilingual catalogue contains textual material by Olafur Eliasson, Marianne Krogh Jensen, Maurice Merleau-Ponty, Rudolf Sagmeister, and Andreas Spiegl. One half of the publication is in English, the other half, reading from the ‘back cover’ and turned 180°, is in German (with identical text illustrations), the two language sections being tied together by a sequence of colour images at the centre. Also shown are images of four large posters with different motifs of wooden staircases in Japanese parks that had served as inspiration for Eliasson. These were placed in front of the museum as a subtle way of announcing the exhibition, thus connecting inside with outside.